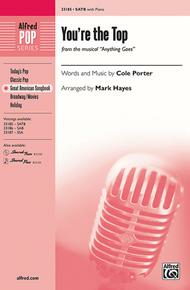 You're the Top (from the musical Anything Goes) composed by Cole Porter. Arranged by Mark Hayes. Choir Secular. SATB choir. Choral Octavo. Pop Choral. Broadway; Secular; Standard. 12 pages. Published by Alfred Music (AP.33185).This famous "list" song from the musical Anything Goes demonstrates Cole Porter's incredible rhyming ability and gives us a partial listing of what was popular in the '30s. (How about an extra credit assignment for your singers?) Charmingly arranged by Mark Hayes.Inst. Parts Available (choral); Recorded Acc. Available.About Alfred Pop Choral SeriesThe Alfred Pop Series features outstanding arrangements of songs from the popular music genre. These publications provide exciting, contemporary, and educationally-sound arrangements for singers of all ages, from elementary through high school, to college and adult choirs.